The G6, sometimes denoted as the G6 Rhino, is a South African mine-protected self-propelled howitzer. It was developed as a turreted, self-propelled variant of the G5 howitzer series, mating the gun to a six-wheeled armoured chassis. Design work on the G6 began in the late 1970s to replace the obsolescent Sexton being retired from service with the artillery regiments of the South African Army. Serial production commenced between 1988 and 1999. At the time of its introduction, the G6 was considered one of the most mobile self-propelled howitzers in service. Its chassis was engineered to be mine-resistant and blastproof, allowing it to survive multiple TM-46 detonations during trials. The G6 was conceived as a wheeled rather than a tracked vehicle for this purpose, as well as to allow it to deploy long distances by road without consuming excessive quantities of fuel or requiring a tank transporter. G6s entered service during the last two years of the South African Border War, frequently shelling positions held by the People's Armed Forces for the Liberation of Angola (FAPLA) during the Battle of Cuito Cuanavale. Their ability to bombard a target and change positions rapidly in less than two minutes, with minimal preparation, greatly reduced the threat posed by retaliatory Angolan air raids and counter-battery fire. A number of G6s were subsequently manufactured for export and purchased by Abu Dhabi and Oman. Export models included a specialist anti-aircraft variant with a GEC-Marconi Marksman turret and twin-barrelled 35mm autocannon. Chile briefly produced the G6 under licence as the CC-SP-45, although this arrangement was later terminated after the system was not adopted by that country's armed forces. Iraq also manufactured its own domestic variant of the G6 as the Al Majnoon with technical assistance from Canadian artillery engineer Gerald Bull, which later evolved into the much larger and more sophisticated Al Fao. South Africa: 43 systems; two are constantly used for training, the rest are in storage  Also known as the GV6 Rhino within the South African National Defence Force. 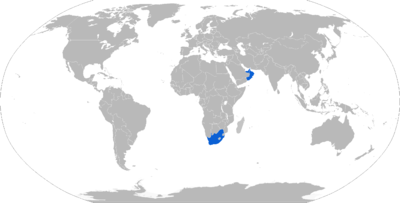 The first G6 prototype appeared in 1981, during the height of the South African Border War. Four engineering development models were being tested with the South African Defence Force by the mid-1980s. In October 1987, the South African government ordered all the G6s deployed to Angola for combat trials as part of Operation Hooper. One suffered an engine failure, so only three actually reached Angola, where they joined expeditionary troops of the 4 South African Infantry Battalion. Operating as an independent battery, the three G6s were instrumental in the bombardment of the strategic Angolan airfield at Cuito Cuanavale. In this their crews were significantly aided by South African special forces acting as forward artillery observers near the airfield; on one occasion the G6s were able to destroy four Angolan Mikoyan-Gurevich MiG-21s on the ground as they attempted to take off. The heightened artillery threat to the Cuito Cuanavale airfield eventually forced the Angolan pilots to relocate their operations to another airstrip at Menongue, which was beyond the range of the G5 and G6 but severely diminished their ability to time and execute their missions, given Menongue's distance from the actual fighting. However, they also began making South African artillery positions the primary targets of their raids, forcing the G6 crews to constantly shift positions after each bombardment. The G6s themselves were considered so valuable that an air defence contingent from South Africa's 10 Anti-Aircraft Regiment was subsequently attached to the battery for the remainder of the campaign. The G6 is not known to have seen combat again until 2015, when a single battery was deployed with the United Arab Emirates Defence Force to Aden during the Yemeni Crisis. The howitzers were landed in Aden by ship and escorted by a large Emirati armoured formation. They have since been used to shell Houthi militant positions in support of Emirati and allied Yemeni offensives carried out near Taiz. ^ Christopher F. Foss. Jane's Armour and Artillery (2002 ed.). Macdonald and Jane's Publishers Ltd. p. 698. ISBN 978-0710623096. ^ a b c d e f Harmse, Kyle; Dunstan, Simon (23 February 2017). South African Armour of the Border War 1975–89. Oxford: Osprey Publishing. pp. 32–46. ISBN 978-1472817433. ^ a b c d e Christopher F. Foss. Jane's Tanks and Combat Vehicles Recognition Guide (2000 ed.). Harper Collins Publishers. pp. 440–441. ISBN 978-0-00-472452-2. ^ a b c d e f g "G6 Renoster 155 mm Self-Propelled Howitzer". Newtown, Connecticut, United States: Forecast International, Incorporated. 2000. Archived from the original on 29 March 2017. Retrieved 29 March 2017. ^ a b c d e f g h i Chant, Christopher (1987). A Compendium of Armaments and Military Hardware. New York: Routledge & Kegan Paul. pp. 76–77. ISBN 0-7102-0720-4. OCLC 14965544. ^ Chant, Christopher (1997). An illustrated data guide to modern artillery. London: Tiger Books International. p. 29. ISBN 978-1855018617. ^ "Weapon systems: Artillery - GV6". South African Army. Retrieved 4 January 2010. ^ a b Greeff, I.B. (June 1992). "South Africa's Modern Long Tom". Military History Journal. The South African Military History Society. 9 (1). ISSN 0026-4016. ^ "Obsolescence risk mitigation study for G6". Rivonia, Johannesburg: ITWeb. 6 September 2011. Archived from the original on 30 March 2017. Retrieved 30 March 2017. ^ a b Camp, Steve; Helmoed-Römer, Heitman (November 2014). Surviving the Ride: A pictorial history of South African Manufactured Mine-Protected vehicles. Pinetown: 30 Degrees South. pp. 224–225. ISBN 978-1928211-17-4. ^ a b c d Weigert, Stephen (2011). Angola: A Modern Military History. Basingstoke: Palgrave-Macmillan. pp. 87–96. ISBN 978-0230117778. ^ Malan, Magnus (2006). My Life with the SA Defence Force. Pretoria: Protea Boekhuis. pp. 236–237. ISBN 978-1869191146. ^ "Trade Registers". Armstrade.sipri.org. Retrieved 20 June 2013. ^ Cordesman, Anthony (1997). Bahrain, Oman, Qatar, and the UAE: Challenges of Security. Boulder: Westview Press. p. 194. ISBN 978-0813332406. ^ Ṣāyigh, Yazīd (1992). Arab Military Industry: Capability, Performance, and Impact. London: Brassey's Incorporated, Publishing House. p. 110. ISBN 978-0080417776. ^ Chauhan, Sharad (2003). War on Iraq. New Delhi: APH Publishing Corporation. pp. 258–259. ISBN 978-8176484787. ^ "Raytheon Fires Excalibur from G6 Self-Propelled Howitzer". Defense & Aerospace Week. 23 May 2012. Archived from the original on 15 April 2016. Retrieved 6 November 2016. ^ "Denel in UK gun link-up". Flight International. Flightglobal.com (14–20 September 2004): 10. September 2004. ISSN 0015-3710. ^ a b c "G6 155mm Self Propelled Howitzer, South Africa". army-technology.com. Retrieved 1 January 2010. ^ "Fact file: G6 L45 self-propelled towed gun-howitzer". defenceWeb. Retrieved 6 November 2016. ^ "G6 Rhino 155mm SELF-PROPELLED GUN-HOWITZER". GlobalSecurity.org. Retrieved 1 January 2010. ^ a b Binnie, Jeremy (7 August 2015). "Analysis: Emirati armoured brigade spearheads Aden breakout". London: Jane's Information Group. Archived from the original on 19 December 2015. Retrieved 29 September 2016. ^ "SA arms used to bomb civilians in Yemen". The Sunday Times. Johannesburg. 11 November 2015. Archived from the original on 25 March 2017. Retrieved 24 March 2017. This page was last edited on 15 February 2019, at 05:13 (UTC).